Ad networks are developing day by day making publishers and advertisers be at a really good benefiting position. Many prefer Google adsense over other ad networks but if for some reason your Adsense gets banned or your websites are not getting selected by the Google Adsense then there is nothing to get dejected : there are various other ad networks which are waiting for you and welcoming you with both their open hands. 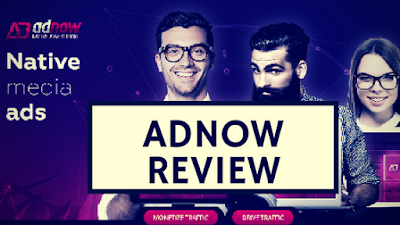 One of them is AdNow.Though AdNow is relatively new in the market but high growth rate along with comparatively better CPC rates gives it a much needed edge among its competitors and this leads to make AdNow the best alternative to Google adsense for the users. Just like Propeller ads is the best for pop up ads and RevenueHits is the best for sales ads similarly AdNow is the best for CPC ads without a doubt. But pop up ads make your website look spammy and in all possibilities it gives negative impression to the viewers. Sales ads are really hard to earn through so CPC ad is the best choice for beginners and an easy choice for the experts. Another advantage of using AdNow is that it recognizes your niche easily and puts really suitable and efficient ads and also gives good results in authority websites. AdNow is basically an advertising agency founded in 2014. It is one of the fastest growing ad networks. Adnow arrived in the market as an advertising network with energetic combination of ideas in digital advertising, big data and RTB of its founding members who are computing genius. This is the best combination to attract new clients and users as everyone is expected to be in profitable position with this. It basically provides widget based ads which can be easily used in any websites by any person with ease as it does not require any rocket science to put its widgets in one’s website. It provides the best rates for the bloggers who look to monetize their website with some native ads and get some money for their pocket. You can discover the experience of real publishers as well as get answers on your questions by visiting the official thread of Adnow on Digital Point Forum - https://forums.digitalpoint.com/threads/adnow-native-ads-official-thread.2765376/ . AdNow is one of the few ad network company which allows users to target any audience globally so that the audience need not worry about targeting specific geographic or demographic location unlike the users of other ad networks which do not work globally. There was a time when you had to worry and be tensed when you did not get registered in Google adsense or you got banned unfortunately but now with arrival of many ad networks you really have a choice to choose any ad networks but due to the highly systematic and technical modeling one should prefer AdNow above other Google adsense alternatives without any doubt or confusion in his mind. AdNow has easy and preferable weekly payment method unlike many other ad network agencies and the minimum threshold of releasing payment is just 20 US dollars. This gives AdNow the most necessary advantage over many other ad network agencies which prefer to provide monthly or bi weekly payment releasing structure to their users. The payment can be received through bank wire transfer or Paypal whichever is preferable and eaiser for the publisher depending up on the choice of the publisher. As a highly respected and client centric ad network company AdNow provides one of the best CPC rates among the ad network companies. This makes it one of the favourite choice among the ad network users. AdNow is one of the proficient ad network company which prefers widget based advertising style over other styles. The sponsored content it displays are the ones related to the content in website which increases the chance of getting clicked by the visitors and get paid more and more with ease and less problematic issues. AdNow is one of the best ad network when it comes to supporting publishers. It provides easy and quick support without any complication or hesitation which makes it look more customer centric without a single piece of doubt. AdNow like other top ad networks has referral program for its publishers. One can get highly appreciable 5 percent referral commission per single referring which sounds like icing on the cake for AdNow users and gives them a reason to stay with it. It can be considered highly beneficial bonus for its users. As we see the highly efficient methods and features used by this ad network company we cannot turn our eyes away from it. It gives publishers the benefits which shows that they do not consider their publisher as a mere business source but regard them highly as they should have regarded their high stake holding business partners. Their grounded approach of support stands as a proof of this approach by them. With availability of each and every necessary key features this ad network is next to Google adsense and may be considered sometimes better than Google adsense when it comes to customer support. The weekly payment and low threshold amount also gives this ad network company a much needed edge to compete and establish in ad network market with ease without many troubling hurdles. Though the final choice is with you but we would suggest that you should once try AdNow because not for nothing this is being considered as the best alternative ad networks to Google adsense.